At first glance, it seems as though unemployment is fairly straightforward. You either have a job or you don’t. However, when the government reports on unemployment, it doesn’t just categorize it according to whether you are employed are not. 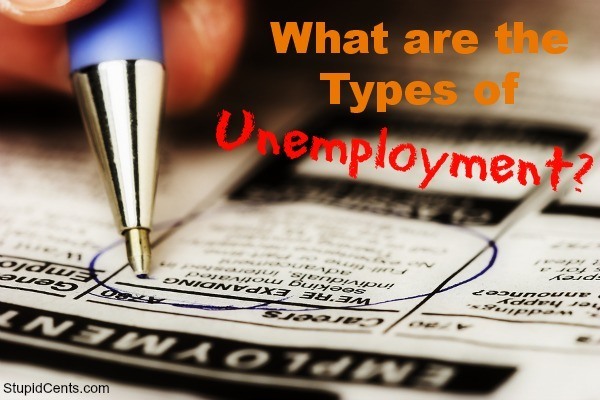 There are different types of unemployment, and the government (and economists) views them in various ways. The very first classification made is whether or not the unemployment is voluntary. With voluntary unemployment, the worker decides to leave a job. He or she might leave in order to find better work, start a business, or for some other reason. Involuntary unemployment is when the worker is laid off or fired. If an employee wants to collect unemployment benefits, he or she must be laid off. This is different from being fired; being fired doesn’t usually qualify you for unemployment benefits. Cyclical Unemployment: This type of unemployment is that kind that coincides with business cycles. Usually, unemployment rises when the economy is in a recession (or a depression). Anytime the business cycle brings about a situation like this, unemployment rises. Lay offs increase, and more unemployment benefits are likely to be paid out. Structural Unemployment: What happens when the skills offered by workers aren’t in demand by employers? In this case, unemployment might occur, even though some businesses need the labor. This is known as structural unemployment, a situation in which what’s needed by employers is not matched by what potential workers actually possess. Frictional Unemployment: For workers, this is the most desirable type of unemployment. It’s the unemployment seen when workers move from one job to another. This type of unemployment is also cited when students graduate and look for a first job out of school, or when a stay at home parent decides to re-enter the workforce after a few years. Each of these different types of unemployment are viewed differently, and have a different impact on the state of the economy. Structural unemployment is perhaps one of the most difficult to overcome, since the market has to wait until workers acquire the skills employers want (or until certain skills come into vogue) before the unemployment situation abates. Other types of employment generally see an end. Frictional unemployment is considered a very short-term situation, since it is presumed that someone with the right skills will be able to find a job relatively quickly. And, of course, cyclical unemployment is something that the government tries to deal with by stimulating the economy and creating a situation where improving economic conditions lead businesses to expand at a rate that requires them to hire more workers. Unemployment isn’t just cut and dry. There are nuances to it, and situations that prompt economists and the government to view some types of unemployment as more problematic than others. Having an idea of how unemployment is viewed can better help you understand policy and economic decisions. Most of the layoffs from people I hear talk about them are due to seasonal changes here. Can’t paint the outside of homes in the winter. Many production jobs here also have peaks and valleys where they seem to do temporary layoffs for a few months out of each year.